Summer is the time where we award our next round of scholarships for students from rural locations in Nepal. Read about how this year’s cohort have been selected! Since 2010, Helambu Education and Livelihood Partnership (HELP), Mondo’s partner in Nepal has been supporting deserving, needy students from government schools located at remote villages in Helambu region who pass their secondary school exams to attend the equivalent of sixth form college – which, unlike the schooling to this point, is not free in Nepal. We started doing this in 2010 just involving pupils from two secondary schools and you can see how this has grown! had 200 applicants from 39 schools. selected 57 students from 29 schools. have 30 boys and 27 girls in the 2017 cohort. 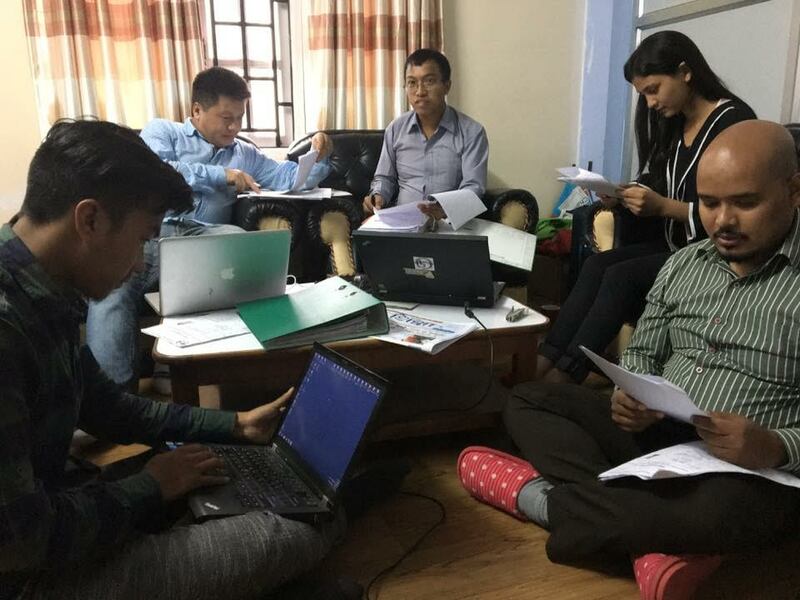 This annual programme is a major one for HELP as its popularity in the region has grown and at its peak for a few weeks dominates the work of everybody in the office – especially Prakash Shrestha who is in charge – (he is the one with glasses you can see in the interview photos). So lots of applications for scholarships, but what are we looking for? Quite simple really. Students whose family cannot afford the fees, who have the academic ability to succeed and, perhaps above all, the motivation to do so and to contribute back to their communities when they are able to do so. What do we require of the applicant? They must complete the application form and be endorsed by their school. We ask them to write two short essays – at least one of them in English – about their motivation for the scholarship and their circumstances. Armed with this information we must choose the most deserving and to do this we look at their application material and their exam grades and shortlist about half of them for interview. Of course the scholarships cost HELP/Mondo plenty and as they last two years we must work to ensure there are enough funds for both years from our donors. Mondo in the UK decides how many we can afford and HELP, this year as in previous ones, can’t resist the temptation to lever in just a few more very deserving cases challenging themselves and Mondo still further! We always appreciate any support for future rounds of scholarships! Once the selection has been made and the fortunate students notified the work has not yet ended. The motivation of the students would not be complete without an awards ceremony and celebration. 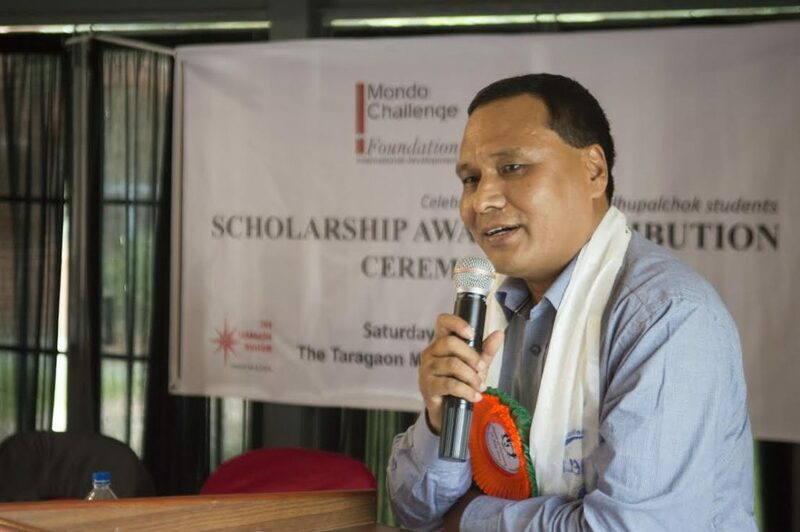 This year amongst the eminent persons who came along to inspire the students was the Managing Director of the Nepalese Electricity Authority, Kulman Ghising, a popular figure in Nepal for removing the load-shedding problem which had dogged people’s lives losing electricity supply for many hours every day. The students took it all in and left with a determination to do well and to help others in the future in return. We look forward to introducing more of our scholars to you in the coming months! Mr Ghising inspiring the students!